The Japan Pavilion ended up being Mik's favorite Pavilion to explore in Epcot. 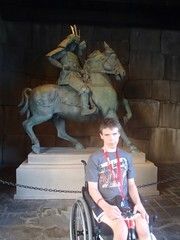 For one, he loved checking out the various anime things in the shops. His favorite part was the Spirited Beasts: From Ancient Stories to Anime Stars exhibit. 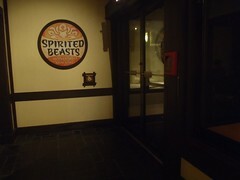 Mik loved that there was an automatic door button for going to the Spirited Beasts exhibit and the button was even framed with wood to make it blend in with the architectural style. The Spirited Beasts exhibit is a great little exhibit about Ancient Spirits and how the ancient Japanese culture has inspired the more modern Anime art. Mik enjoyed finding many references to the various anime series he has watched on television and online.